I am sure that everyone has “dreaded tasks”, ones that loom larger than life. This is such a project for me. It is a comforter that my mother and I started many years ago. My mother was not doing so well, but needed a project of purpose and so I brought her a stack of quilting materials for her to cut into blocks to make a comforter for my sister. 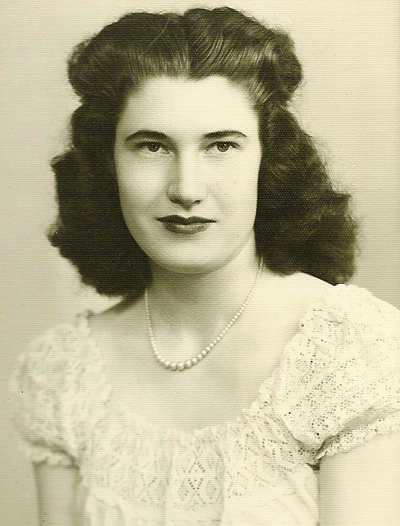 My mother was a beautiful quilter, but as she aged her skills decreased, but not her spirit. She set about this task, as if it would be her last, and it was. She cut out a stack of these simple square blocks with a plastic template. All were less than accurately cut, but as serious as she was, I was equally as serious about laying them out. Not stitching them on the machine as fast as she would like, my mother worked to stitch them together by hand. It was her way of sewing. She meticulously sewed everything by hand, even dresses for me when I was little. The project had to be put away as my mother’s needs grew, and I had all I could do to take care of her, instead of finishing the comforter. I assured her that I would get to it as soon as I could and my sister would receive her comforter. And so, over six years after my mother died, I decided this holiday season to get it back out, determined that I would finish it for my sister. The backing and batting were ready for its completion. It was a simple enough task to complete it in a few days, or so I thought. The only challenge was having a table large enough to lay it out on, as our beds are used nightly and speed is not my style these days. My mother and I made many of these sorts of comforters in her day. Almost everyone in the family had one. They were much loved, though they weren't like her museum-quality, hand-pieced, hand-quilted quilts for which she is most known for. These were ones that got laid out on the floor during slumber parties, or used on beds shared by pets as well as children. They are bright, colorful and made for every-day hard use. I said they were simple. This one has been anything but. My mother’s last hand stitches would not have stood the test of everyday use. They were not tiny like the stitches in her past, and all needed to be reinforced with machine stitching. Doing this after it was all stitched together was more difficult than simply stitching them on the machine from start to finish. I couldn't get into all corners to secure the stitching. I did the best I could and then reinforced with hand-stitching up to each corner and laid it out to tye it together. What made me call my sister that day, I will never know. I called to confirm her present bed size and we both realized that when this quilt was started, she was using a double bed and now has a king-size bed. 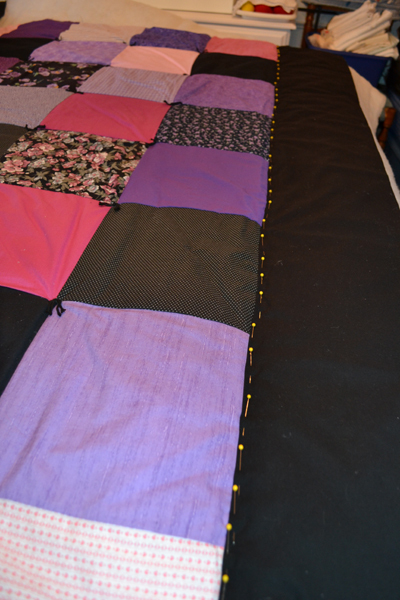 I had already tied the top to the bottom and had planned for a big wide border, but this border was in no way wide enough to make the quilt grow into king-size. I would have just started another one and finished this one to be the size that it was intended to be, but this was no ordinary comforter. It was the last one my mother had partially made for my sister. The sentiment alone made it valuable to her, and so I stopped it right there and literally “slept” on the problem. Days later I talked with my sister, telling her that I could add a wide striped border to the edges and make it big enough for her king-sized bed. I went and purchased yards of more material and high loft batting, though already I was wishing it was low loft batting, wondering how I would ever ship it once it was finished. I told her that my goal to have it done by Christmas had changed with the extra work involved. I had to smile, for once again, what was once an easy straight forward project had grown into a major undertaking. It seems to be “my way”, making anything twice as hard as it needs to be. 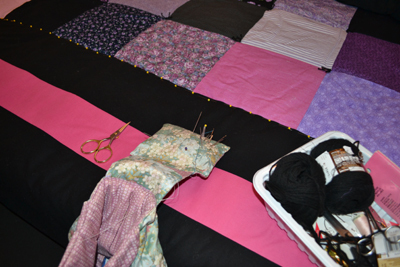 Anyone that knows anything about quilting knows that the usual process of making a comforter is making the top and then building the “quilt sandwich”by layering the backing, the batting and then the top. This one is already mostly tied and is now fat and huge, and I will have to reconstruct the top, adding borders while the backing and batting are already hooked together though the edges are raw and open. My plan is to tear strips and sew them together on the machine and then add this striped border to the top by hand. The plain eight and a half inch black border is be at the top of the quilt and the striped eighteen and a half inch border would be added on the sides and bottom. 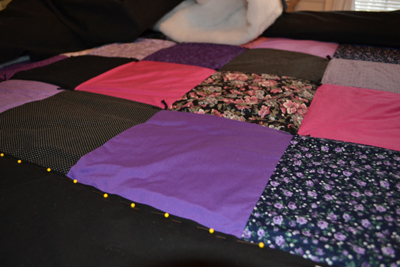 The blocked portion of the quilt would then be centered on the top of her bed. I will miter the corners so the borders of the stripes all meet framing the pieced top. By pressing under the seams of the borders, I will then simply whip stitch them to the top of the quilt sandwich. I will have to take care to make my stitches tiny, invisible, and secure enough to be like a machine stitch. None of this is difficult, only time consuming and awkward as the batting and backing are already attached up to the edges where the borders were to be finished.. I will have to baste on more batting where needed to extend it out to what will be the new edge and then do a flush edge with a tucked under outer seam all the way around. The plan is sound except that we had centered the backing, instead of leaving it longer on the bottom, so I would have to cut off the extra backing at the top and add it to the bottom of the backing, in the same manner as I had added the borders to the top. I now know why I don’t do many bed-sized quilts as we had to add an extra fold up table and ironing board to extend my mother's dining room table, filling up the entire room to support this work.. I remember well my mother creating beautiful quilt after quilt on this same table. Her’s were usually low-loft quilts all hand stitched together using quilt-as-you-go-technique. This is a different sort of process. Her blocks were all individually quilted and then sewn into strips by hand using this same sort of hand whipped stitch and then these strips were stitched together, the quilt getting larger as it was being finished. I will use a similar technique only working on a very large high loft comforter the entire time. May my mother’s quilting angels be with me, and my mother’s spirit too. This will be a warm up to completing my mother’s last hand-quilted quilt that I promised that I would finish, now a prerequisite for me getting into heaven! I have not been brave enough to tackle it. Perhaps there is a reason why my sister’s bed grew and needed her comforter to grow as well. Perhaps my mother’s spirit is behind it all, helping me to face the challenges of finishing her last museum-quality, hand-quilted quilt after I finish my sister’s. I think I will get ready and go to church before I begin this undertaking. I know what I will pray for! It is hard to believe that I was once an avid quilter in my younger days. 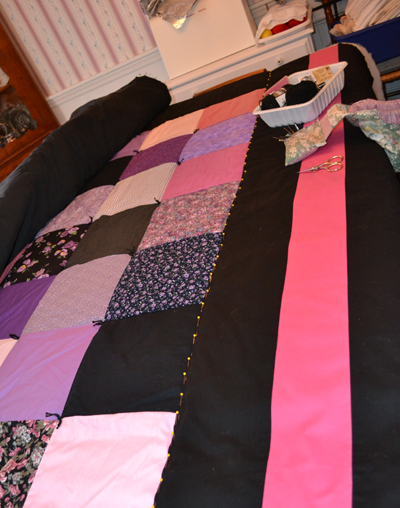 Did I mention that I have several quilts of my own that need finishing? Perhaps it is a good thing I don’t own a gun! ?